Afghan Hound A large breed of dog, Afghans have a regal bearing. A member of the sighthounds, they have a truly remarkable ability to leap. Their long silky coats require quite a bit of attention. This is an ancient breed of hound that needs daily exercise in a large, preferably enclosed area. more information on Afghan Hounds. Basenji This breed originated in Africa, and dates at least as far back as Ancient Egypt when they were presented as gifts to the Pharaohs. This is a small dog with a short coat and an independent nature. Training at an early age makes them nice family dogs. Basset Hound Known for their loud baying when excitedly trailing, this is a scenthound in the AKC Hound Group. Even-tempered, good-natured, and amiable are all used to describe this charming breed of dog. An excellent family dog, requiring some daily exercise. They are devoted to their family companions. 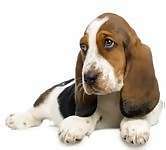 more information on Basset Hounds. Beagle Part of the family of scenthounds, the Beagle is one of the most popular breeds of dogs. They come in two sizes, 13" and 15". Originally bred as pack hounds, they require companionship and make excellent family pets. Good natured and gentle, they are great with children and adults. Daily exercise is required but their short dense coats require only minimal care. Black and Tan Coonhound Originally bred to trail and tree raccoons, this scenthound is an American dog breed. They have a good combination of courage, speed, and agility and are well suited for larger game hunting. The friendliness allows them to be good family pets. They require daily exercise. more information on Black and Tan Coonhounds. 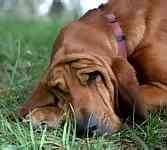 Bloodhound One of the oldest of the scenthound breeds, their trailing and tracking ability is outstanding. Very sensitive in nature, they must be handled with kindness. This noble breed requires quite a bit of daily exercise and makes a loving, docile family companion. Borzoi This sighthound was bred by Russian aristocracy, hundreds of years ago, to hunt wolves. It is also known as the Russian Wolfhound. This is a large dog requiring daily exercise, but with a shy, elegant nature. They will chase anything and need to have fenced large areas to run. Dachshund These muscular and playful dogs were originally bred in Germany, in the 1600's, to hunt badgers. They retain their low to the ground, long bodies, and are nicknamed "weiner" or "sausage" dogs. The AKC recognizes the standard and miniature versions, both having three possible varieties of coats. These are excellent family pets requiring moderate amounts of daily exercise. Greyhound This is the fastest breed of dog, and has an ancient and royal history. The quintessential sighthound, this is a sensitive, well-mannered dog that makes an excellent family pet. Their coat is easily cared for and they require daily exercise, preferably in a safe area. Irish Wolfhound The AKC describes this breed as having great size and a commanding appearance. Originally bred to hunt wolves and elk in Ireland, they have become valued family companions in modern times. The tallest of the sighthounds, they require large amounts of soft and comfy spaces, places to run, and a willingness to care for a very large dog. more information on Irish Wolfhounds. Norwegian Elkhound This ancient breed of dog was prized by the Vikings as both a hunting and guard dog. Happy in spirit, they love to be outside in cold weather for playtime. Equally important to them is human companionship. They are excellent family pets. more information on Norwegian Elkhounds. Redbone Coonhound An excellent general hunting dog with a "flashy red coat". Becoming a member of the AKC Hound Group in 2009, this breed was well known prior to that in the southern United States. They are well loved family pets that benefit from some formal training. 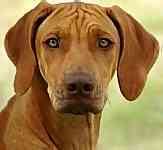 more information on Redbone Coonhounds. Rhodesian Ridgeback Also known as the African Lion Hound, their unique feature is the ridge along their back. Bred as both hunters and guardians, this excellent family companion loves to please people, yet remains very dignified in bearing. more information on Rhodesian Ridgebacks. Saluki One of the most ancient breeds of dogs, images of the Saluki are found in Egyptian tombs. This thin and graceful sighthound has a sensitive nature and requires a very gentle hand. Its innate strength and speed require it to have a safe enclosed area to run or long leashes. Whippet One of the most popular of the sighthound breeds, the Whippet is an excellent family companion. Extremely gentle in nature, this breed needs equally gentle training and correction. Daily exercise, minimal coat care, and a really nice warm bed will keep them happy and healthy. Many of the dog breeds in the AKC Hound group were originally used as hunting dogs. This is a diverse group of purebred dogs. The specific talents for which some were bred include a heightened sense of smell, extreme speed and agility, and the ability to hunt specific types of game. Sight hounds, known for their speed and stamina, include the Afghan Hound, Borzoi, Greyhound, Irish Wolfhound, Scottish Deerhound, the Saluki, and the Whippet. Scent hounds are able to follow a game trail using their amazing sense of smell, and include the American Foxhound, Basenji, Basset Hound, Beagle, Black and Tan Coonhound, Bloodhound, Bluetick Coonhound, Dachshund, English Foxhound, Harrier, Norwegian Elkhound, Otterhound, Petit Basset Griffon Vendeen, Plott, Redbone Coonhound, and the Rhodesian Ridgeback. Specific game hunters include the Dachshund, which hunted badgers; the Irish Wolfhound, which hunted wolves; the American Foxhound and the English Foxhound, that hunt fox; the Scottish Deerhound, bred to hunt deer; the Rhodesian Ridgeback, originally a lion hunter; the Pharaoh Hound, which are excellent rabbit hunters; and the Otterhound, for hunting otters. This breed directory page features dog breeds that are members of the AKC Hound Group.